Ever go swimming with rings on your fingers or hoops in your ears only to find your jewelry had vanished after your dip? If so, you've got something in common with ancient Romans. Ancient texts give some clues as to the variety of activities that took place in bathhouses, Whitmore said, but the texts are maddeningly vague on some details. So Whitmore turned to the concrete evidence: objects found in the floor and pool drains of the ruins of baths. 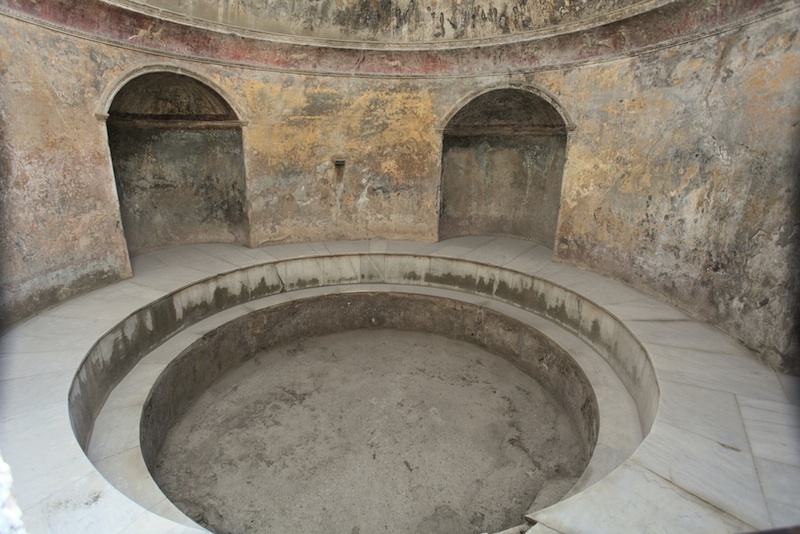 Whitmore examined drain finds from 11 public and military baths in Italy, Portugal, Switzerland, Germany and Britain, all dating between the first and fourth centuries. Unsurprisingly, she found strong evidence of objects related to bathing, such as perfume vials, nail cleaners, tweezers and flasks for holding oils and other pampering products. On the less-relaxing side of things, evidence shows medical procedures may have occasionally occurred in the baths, Whitmore found. Researchers found a scalpel lodged in one drain. And in the Caerleon baths in what is now Wales, archaeologists uncovered three adolescent and two adult teeth, suggesting bathhouse visitors may have undergone some dentistry, too. Visitors also took their meals in the baths, judging by the fragments of plates, bowls and cups found swept into drains. At Caerleon, bathers snacked on mussels and shellfish, Whitmore said, while baths in Silchester, in the United Kingdom, showed traces of poppy seeds. Bones left behind reveal that Roman bathers enjoyed small cuts of beef, mutton, goat, pork, fowl and wild deer. "Ancient texts talk about finger food and sweets, but don't really talk about animals," Whitmore said. "That was interesting to see." Archaeologists have also found signs of gaming and gambling, including dice and coins, in various bathhouses. Perhaps most surprising, Whitmore said, researchers found bone and bronze needles and portions of spindles, suggesting that people did textile work in the baths. This work likely wouldn't have happened in the water, she said, but in dressing rooms or common areas that had seating. The needles may have belonged to bathers who brought needlework to pass the time, or employees may have brought the sewing equipment, offering tailoring or other services at the sites while bathers relaxed, Whitmore said. 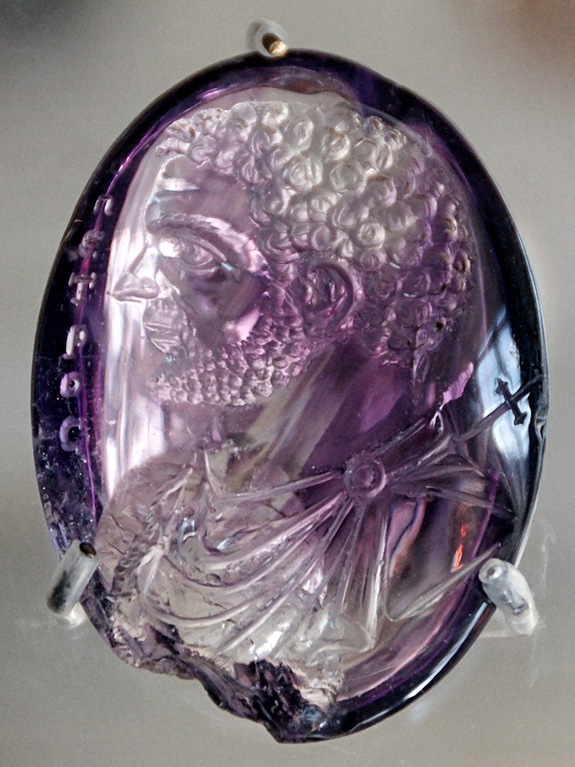 This is a Roman intaglio, or engraved gem, dating from A.D. 212 and held in the treasury of the Sainte-Chapelle in Paris. Intaglios similar to this were sometimes found in roman bath drains. Among the sparkliest finds in the drains were pieces of jewelry. Archaeologists have found hairpins, beads, brooches, pendants and intaglios, or engraved gems, in bathhouse drains. A number of these finds definitely come from pool areas, Whitmore said. "It does seem that there's a fair amount of evidence for people actually wearing things into the water," she said. Bathers may have held onto their jewelry in the pools to prevent the valuables from being stolen, Whitmore said. Or perhaps vanity inspired them. "It's really a place to see and be seen," Whitmore said. "It makes sense that even if you had to take off your fancy clothes, you would still show off your status through your fancy jewelry." Unfortunately, dips into hot and cold water would have loosened jewelry adhesives and caused metal settings to expand and contract. As a result, a number of unlucky Romans emerged from the baths considerably less bedecked than when they entered. Whitmore reported her results Saturday (Jan. 5) at the annual meeting of the Archaeological Institute of America in Seattle. She plans to expand her analysis of bath artifacts to better compare changes in activities over time and in different regions. One constant she's already found, she said, is the presence of women, even at baths on military bases. "It adds further evidence that Roman military forts aren't entirely these really masculine areas, but a much wider social atmosphere than we tend to give them credit for," Whitmore said.